Green beans (and yellow beans, string beans, runner beans, snap beans, lima beans broadbeans, etc.) are very easy to grow. They thrive even in poor soil. 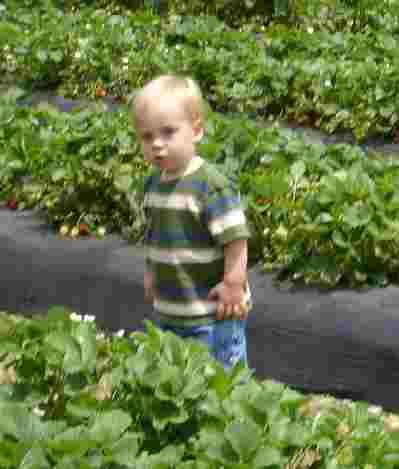 Whether you grow them yourself or pick them at a PYO farm, or buy them at the market, they're available fresh almost everywhere. 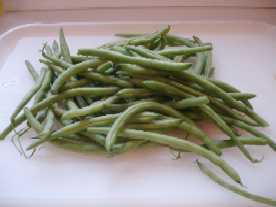 Beans are a warm weather crop, and cannot tolerate any frost nor cold soil. 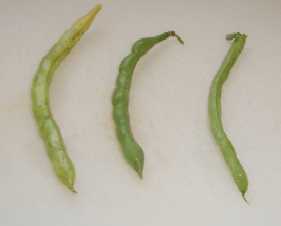 In the U.S. green beans typically peak during July through October in the South, and in August and September in the North. But they can be ready as early as early June in many places, as they only take 45 to 60 days from the time the seed is planted! Always call before you go to the farm - it's hard to pick in a muddy field! Most growers furnish picking containers designed for green beans, but they may charge you for them; be sure to call before you go to see if you need to bring containers. Bring something to drink and a few snacks; you'd be surprised how you can work up a thirst and appetite! And don't forget hats and sunscreen for the sun. Bugs usually aren't a problem, but some deet might be good to bring along if it has been rainy. Most beans these days are "stringless". That refers to a string, tough filament of the bean that runs along the outside from one end to the other. Some beans have two, one on each side; and some have one. I prefer to snap the bean off the plant just below where the stem attaches to the bean. If you do this, it will save time when you get home, because one end of the bean has already been trimmed. But this only makes sense if you will be using, cooking, canning or freezing the beans that day. If you won't be using the beans the same day, then break off the bean from the plant along the thin stem that connects the bean to the plant. The beans snap off pretty easily. hence the name "snap beans". Pole beans are the easiest to pick, because, since they grow up poles or twine, you don't have to squat down or bend over! Whether you pick green beans from your garden or at a Pick-Your-Own farm, here are a few tips to keep in mind. smooth, not wrinkly on the surface - that's an old or dried out bean. not lumpy - those lumps are the beans that are developed - that's an overripe green bean! Of course, if you want mature beans (not including the pod) then that's a different story, but we're talking about green beans here). - dried out and damaged. Put them in the vegetable crisper in the fridge, in a loose plastic bag. Now, get ready to can or freeze the extra green beans - It is VERY easy! Click on the links for easy instructions.